Hi. At last I have the car with me.its nice and in good condition.thank you again for being trustful may god bless you. Thank you for your service. The car is perfect, it's just the same what we have accepted. I hope we'll continue our friendship. I just Email to say a Big Thank you for the car which i am enjoying. You the Best car dealers and the car is better than the way it was looking at the photos.Once again THANK YOU SO MUCH. Thank you, I Confirm to have received my valued motor vehicle TOYOTA IPSUM 82703. Condition is Good! Please keep it up. I received the car in good condition as i expected, many thanx to trust company for being trustful. It has been long since i got in touch with you.How are you? I wish to you inform that i received my ISUZU BIGHORN on 4 August 08 . The vehicle is in a very good condition, i still dont believe its me! In fact where ever i have driven it people call me BOSS . Thanks a lot Yuki and your company TRUST.Now i DRIVE WITH PRIDE. HERE IS A PICTURE WITH ME AND MY VEHICLE THAT I BOUGHT FROM YOUR COMPANY THAT YOU CAN ADD TO YOUR TESTIMONIALS ON THE WEBSITE.. THE CAR CAME IN GOOD CONDITION, INTERIOR WELL KEPT, LUCKILY NOTHING WAS STOLEN DURING SHIPMENT.CLUTCH AND PRESSURE PLATE WAS THE ONLY MAJOR PART I HAD TO CHANGE. THANKS VERY MUCH HAVE A GOOD DAY. That is the Isuzu truck I purchased from your company recently and the photos you asked for. Hi and how are you doing just a few lines to say thank you and that i got my vehicle in excellent condition. it was my pleasure doing business with you and hope to do more with you in the near future.keep up the good work. the condition that you keep your vehicle and the way that i got it prompt questions about your site. i have been telling people that you got the best quality vehicles at the best price.thanks once again and god bless you and your company. I have received my vehicle and I am very happy with it. I would like to buy another one with the stock number 78625.I want to know if you couldn't reduce the price as I am already your customer. Thank you. Good Morning Madam, I'd like to let you know that I received the car. It's in good conditions,only the driver who brought it from Dar-es-salam to Bujumbura heated something but is not a big issue. Thank you very much for your assistance. This is to inform you that the Isuzu Dump that I order arrived safely and I am happy and already using it to ferry building materials for our farm. My family like it! Thank you so much for your efficient service and attention. In the event of my wanting another vehicle, I will definitely get it from your company. my regards and God bless. How is business. am happy to tell you that i have receive the LAND ROVER DISCOVERY V8. last week.it is so nice i cant imagine. I REALLY APPRECIATE YOU SERVICE TO ALL TRUST COMPANY. its pleasure to do business with you guy. [...] let me take this opportunity to convey my thanks for your cooperation in this business, i do acknowledge that i have already received my car i purchase at right time as you estimated,i will remain royal to you in another purchases. I would like to thank you for the beautiful vehicle that you sold me. Many people were saying the vehicle was a new one, because of its appearance and performance. I would also like to thank you for the honest and professional manner in which you handle your clients. I collected my Datsun on 3 June 2008 from Dar-es-Salaam. Please keep it up and do not allow others to surpass you. How is Nagoya?. We received our unit(Toyota Nadia), thank you for serving us. We hope to continue buying from Trust Company. I would like to take this opportunity to thank all staff of Trust Company Limited who assisted right from the start up to the end in helping me acquire my new Toyota Starlet Glanza which arrived just yesterday. I must say that i was quite impressed with the car from the interior to exterior - absolutely an eye catcher and in mint condition. Thank you Trust Company Limited and i would not hesitate to recommend anyone if interested in buying a vehicle - to purchase through your company. I thanks you personal and your company the above vehicle is on my hand also i received it in good condition I don't have any complain. Please don't hesitate to assist me for next purchase. 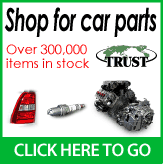 I bought a car from the Trust Company Ltd, through their very user-friendly website (japanesevehicles.com) as recently as two months ago. I was extremely pleased with the response rate and professionalism of their dedicated staff, in response to my inquiries by e-mail. When the car finally arrived, I realized I did not go wrong in choosing and relying on the Trust Company. My mechanic, who examined the car a day after it arrived had this to say: "The car is virtually new. It is an excellent buy" He was surprised to note that the spare key, tools and user manual were included, intact. I share his observations!!! Last week, I decided to test-drive the car and I drove, in the company of my family, a distance of about 650 kilometers, from Arusha to Dar Es Salaam, in Tanzania. The performance of the car in fact exceeded my expectations in terms of comfort, fuel consumption, efficiency and maneuverability. On our return to Arusha, my 8-year old son asked me "Daddy, when are wegoing to have such a long drive again in your new car?" I smiled, having understood him perfectly well, and promised another ride soon. My decision to purchase a second car from the Trust Company for my "first lady", says it all: SATISFACTION. The Trust Company is indeed worthy of the name. CONGRATULATIONS. Hoping you are all doing well with you Trust Company Team. I am very glad to inform you that I have received my Unit some days ago. Really it seem very powerfully and already travel from the big city to my small city it is about 750Km a journey of a day and it seems doing well. With no complain. The unit is smart and very clean inside. For sure I Trust You and Trust Company also. Till Next time when I will decide to have another. Thanks so much.